These new Tridair Self-Braoching KEENSERTS® Inserts have a Vespel SP polymide resin locking element to provide an interference fit with the bolt at the time of assembly. The Vespel material allows for high temperatures and multiple reuse. They have been tested to 6000F with an INCO 7-18 bolt loaded to 120 KSI stress for 6 hours. And, after fifty repeated tests the minimum breakaway torque of the insert was still within the values of MIL-I-45914 and other applicable specifications. The 420 CRES KEES ease installation into parent materials with Rockwell hardness of RC44 or less. Unless otherwise noted, all dimensions are in inches. See reverse side for Hole Preparation. Installation and Removal Data. 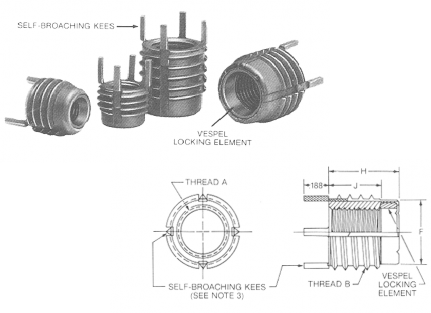 Inserts with Internal Thread “B” size .250 and below are furnished with two Self-Broaching KEES: all others are furnished with four.